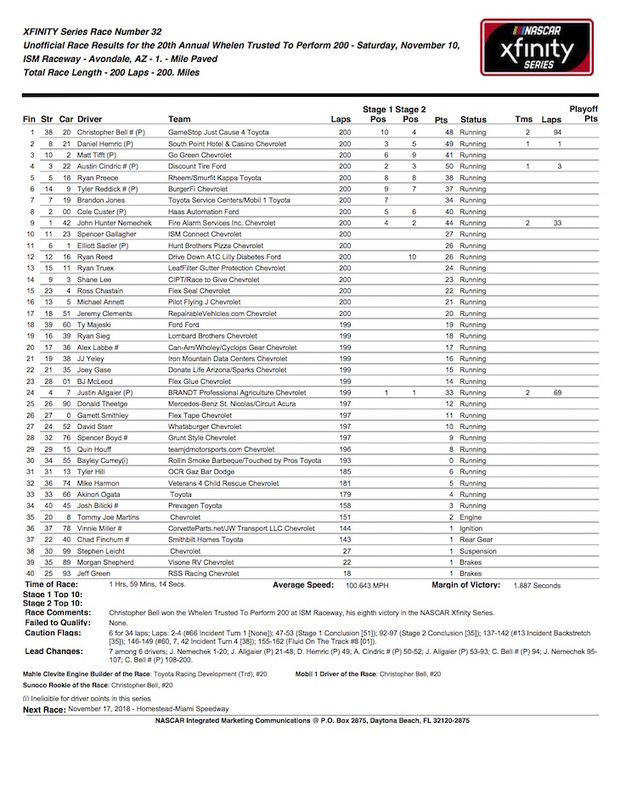 during the NASCAR Xfinity Series Whelen Trusted To Perform 200 at ISM Raceway on November 10, 2018 in Phoenix, Arizona. 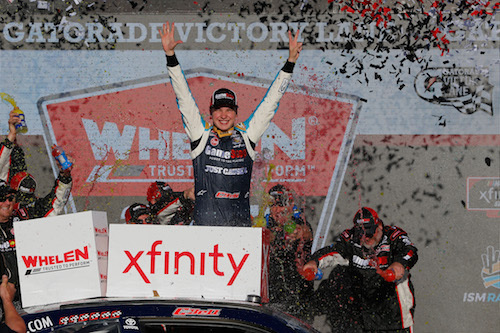 Despite his NASCAR Xfinity Series leading six wins, Christopher Bell was in danger of not making the championship four to vie for the 2018 Xfinity Series championship Nov. 17 at Homestead-Miami Speedway. Bell, though, secured his advancement to the championship round of the playoffs with a seventh win on Saturday at ISM Raceway near Phoenix after leading 94 of the 200 laps that made up the Whelen 200. Other drivers advancing to the final round include Texas Motor Speedway race winner Cole Custer and Daniel Hemric and Tyler Reddick, who advance on points after second and sixth-place finishes Saturday. Bell started the race 38th after an issue in inspection kept him from making a qualifying attempt earlier in the day. He was in the top-10, though, by the time the first stage ended at lap 45 and inside the top-five by the end of the second stage at lap 90. Bell passed John Hunter Nemechek to take the lead on lap 108 and ran up front the remainder of the race. Justin Allgaier won both 45-lap stages in the first 90 laps after taking the lead from pole sitter Nemechek on lap 21. But after leading 69 laps, Allgaier wound up a lap down in 24th at the checkered flag. His car sustained significant damage in a lap 145 incident that resulted in the fifth caution of the race, and in later laps, he reported a brake problem. As a result, Allgaier was eliminated from the playoffs after a wins tally of five that trailed only Bell’s total. Matt Tifft, Austin Cindric and Allgaier’s JR Motorsports teammate Elliott Sadler also were eliminated from the playoffs one race shy of season’s end. The JRM teammates were the only two of the eight playoff drivers at Phoenix to finish outside the top-10. Sadler was 11th. Tifft and Cindric finished third and fourth. Other top-10 finishers included Ryan Preece in fifth, Brandon Jones in seventh, Custer eighth, Nemechek ninth and Spencer Gallagher in 10th.